“That, she supposed for a moment, was the one thing her feeble life had given her access to: the power to put together brightly coloured memories, to mix them and heighten the resultant shade …” From Chrysalis, by Michael Feeney Callan, Best Irish Short Stories, (Paul Elek, London). Michael Feeney Callan started as a poet, publishing in David Marcus’ New Irish Writing, then won the Hennessy Literary Award for short fiction. The novelist John McGahern, judging the awards with Melvyn Bragg, commended Callan’s “deep insight and sensitivity”. After several plays for radio, Callan’s drama television debut was The Burke Enigma, a six-hour noir-style landmark production for RTE, starring Ray McAnally and Donal McCann, which went forward as Ireland’s entry for the Prix Italia. Subsequently he joined BBC TV Drama in London, where he story-edited Shoestring, whose first episode scored the highest ever audience for a BBC thriller. Callan later wrote for the international ITV action series The Professionals, and wrote Gabriel Byrne’s first television play, Love Is, co-starring Tom Hickey. He also adapted Frederick Forsyth stories for Mobil Showcase on PBS in the US. Throughout the eighties Callan partnered with Morgan O’Sullivan’s pioneering production set-up based at MTM Ardmore Studios conceived to alter film investment law and attract Hollywood-based co-productions into Ireland. This visionary enterprise came to fruition in the noughties with Morgan’s breakthrough worldwide syndicated series like The Tudors and The Vikings. Over a decade, Callan wrote several novels for the BBC in all genres based on some high-profile TV series, including Sweet Sixteen, Jockey School, Target and Capital City. His interest in film history and popular culture also inspired a series of best-selling biographies – of Sean Connery, Julie Christie, Richard Harris, Anthony Hopkins and, most recently, Robert Redford. His book, Robert Redford: The Biography (Knopf, 2011), written with Redford’s cooperation over the span of a decade, was a New York Times extended list best-seller and was rated by the Sunday Times as one of its recommended Best Books of the Year. 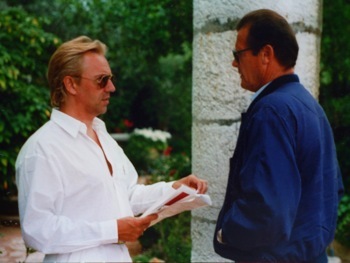 As a director and producer, Callan’s credits include documentaries on The Beach Boys, The Dubliners and animators Don Bluth and Gary Goldman, and the interview series My Riviera, featuring Joan Collins, Roger Moore, Charles Aznavour and other notable Cote d’Azur residents. He was also the writer and co-director of the legendary singer Perry Como’s final PBS television special. In 2012, Callan wrote and produced Channel 4′s Sounds from the Cities, a platform series launching new musicians across the British Isles. Callan has published two poetry collections, Fifty Fingers (2003) and An Argument for Sin (2013), and the novels Lovers and Dancers and The Woman and the Rabbit. He is currently at work on a new group biography that explores the role of the muse in the evolution of popular culture. 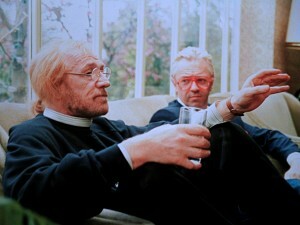 Working with Richard Harris on his biography.